t*rexes and tiaras: Through the looking glass..
Oh boy, am I ever pleased to see the weekend?! It's been a ridiculous week; as usual I've tried to fit too much in to not enough time. I'll probably never learn. I'm just not very good at letting people down, so I agree to things and then wonder afterwards how I'll manage. I've also had a couple of weird things happen, and have been trying my best to be brave. It's kind of working, most of the time. I just have to remember to keep it up. Anyhow. 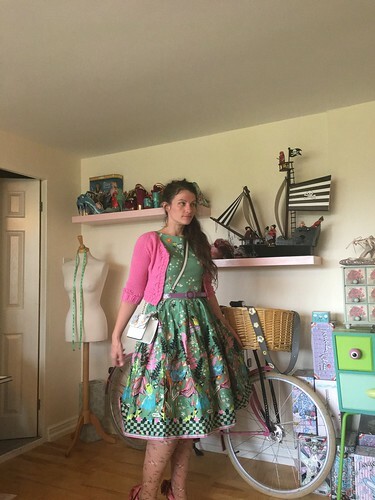 onto this outfit, which I really liked together. 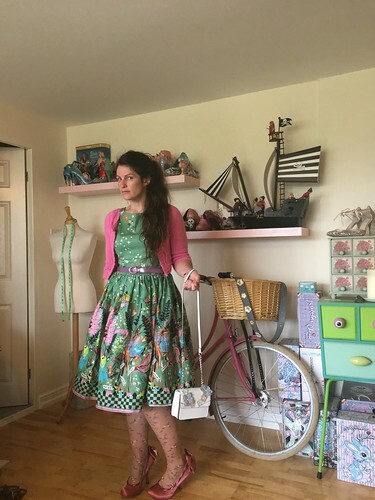 This is another of my new Lindy Bop dresses from my recent haul - I love the Alice print against the pale green background. This shade of green doesn't seem to feature all that much in my wardrobe thus far. 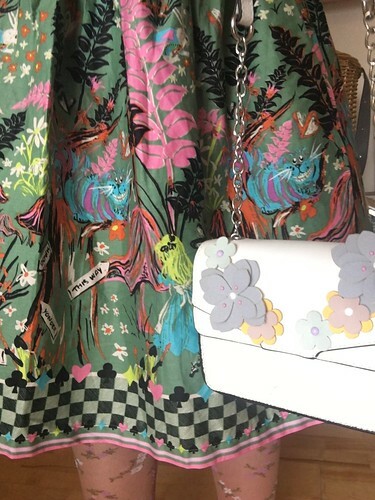 I love that the print on this dress is so colourful that it seems to go with just about anything. I went with my most favourite floral tights (seriously, I wear these *so* often!) and this teeny bag which I picked up from Primark earlier in the year. Finished off with these IC heels, and my first ever hand-knitted Miette cardigan, I was ready to face the world. And some annoying meetings. Bah. Roll on weekend.